On February 1st 2017 Lauriston Farm Limited was registered as a Charitable Community Benefit Society. It is a very exciting step for us as we launch our Social farming Initiative. Volunteers and employees form the Board and Executive and we aim to start trading on April 6th. Very soon you will be able to become a member of Lauriston Farm Limited by buying Community Shares in the Society. We have revised the dates for our Seven Days of Biodynamic Training - the course now starts on Saturday March 11th with a warm welcome and n exploration of the concept of the farm organism followed by a full walk around the farm. The following six days follow with a gap of three to weeks between them with the whole course ending on Saturday July 15th with a day devoted to the honey bee. In between these two days we cover all the biodynamic preparations, seed sowing and saving, the planting calendar and a biodynamic look at farm animals. Each day runs from 10am to 5pm with classroom learning in the morning and practical learning in the afternoon with a bring and share lunch in between. The full timetable can be found by clicking here. Our beautiful range of very soft, certified organic throws, woven from the fleeces of our Biodynamic North Ronaldsay sheep, are on special offer in the run up to Christmas. The throws are perfect to cuddle up under, in front of a roaring fire on a cold winter's night. The simple fact that they are 100% pure wool means that they keep you wonderfuly warm without feeling clammy, over hot or, dare I say it, sweaty. The added fact that there are absolutely no harmful chemicals used in any part of the process from the animal being born right up to the throws being brushed and packed give you the peace of mind that what you are enjoying has very little environmental impact. One throw covers amply a simgle bed and really they can be used on a double bed. They are machine washable and hard wearing. Now the fantastic news that, for a limited time, we are selling these for only £55 each - this is an amazing opportunity to acquire a very high qality throw which would normally retail in most stores for something like £80 with the added benefit of you knowing exactly where the product has come from. We can post these first class and so for the special Christmas gift don't hesitate to look at our throw web page and place an order quickly to have an extra cosy festive season! Five new sheepskins just arrived in time for Christmas! Our last few skins of 2016 have just arrived and they are the best ever! The fleece is really soft and thick with lovely long main hairs all in tact, looking beautiful and feeling incedible. As usual, the leather is soft, strong and very healthy. Click here for the pictures. Seven Day Introduction to Biodynamics is back! Following two successful courses and then two years off, it is back, the Seven Day Introduction to Biodynamics - read about it here and then book a place! A farm based, comprehensive course for beginners to Biodynamics covering all the basics with lectures in the morning and practical work in the afternoon. We hope by the end of the course you will be able to apply Biodynamics in your situation. Spencer Christy, Biodynamic farmer and gardener with fourteen years experience, hosts the course with help from farm co-workers and volunteers. 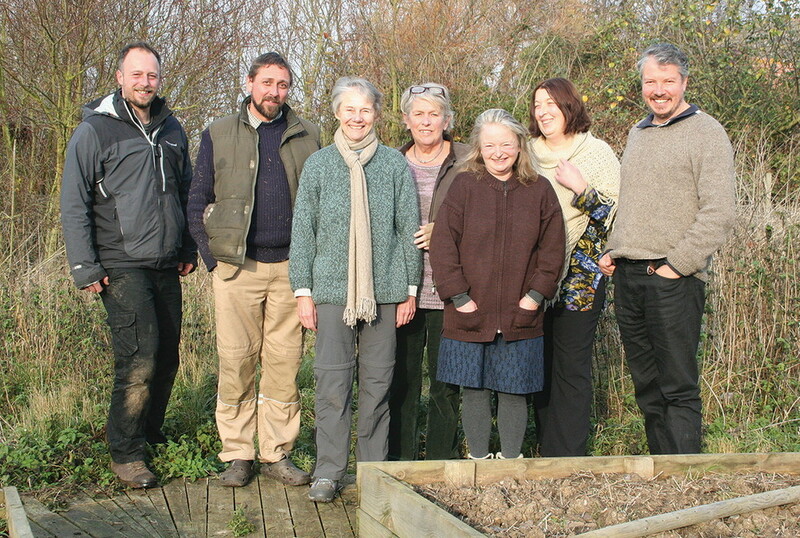 Guest lecturers include the Seed Co-Operative and Patrick Dixon, actor and Anthroposophical researcher. Running on seven Saturdays spaced three to four weeks apart from January to June 2017 we will move from mid winter through Spring and the lambing season into mid-Summer. Total cost for the seven days is £300 with individual days available at £50 each. We have ample parking and can arrange lifts to and from Witham station which is forty five minutes from Liverpool Street station in London. In managing our herd of Shetland cattle, we produce delicious, biodynamic beef which is all over four years old. The taste is incredible and purchasing this beef contributes to the upkeep of the herd as they undertake they daily work of providing habitat for ground nesting estuarine birds on the Blackwater Estuary Site of Special Scientific Interest. Our herd is closed with one bull and nine cows and thier entire diet comes from the grass and other plants on the farm. Medicine used is homoeopathic, herbal and energetic with only thee antibiotic uses since 2006. The meat is butchered to standard cuts and comes in mixed boxes from five kilograms upwards and we charge £12 per kilogram with free local delivery, farm gate pick up and delivery further afield at a small charge. See the Biodynamic Shetland Beef section of our website for more information. Having arrived during the middle of lambing this year, at last, here are our latest sheepskin rugs fresh from Nicki Port's organic tannery in Herefordshire. The skins come from our Demeter certified pedigree North Ronaldsay ram lambs when they are sixteen months old. Each one is truly unique as you will see by visiting the Organic Sheepskins page in the Farm Produce section. These wonderful little sheep produce a truly wild looking fleece with long mains and a wide variety of colours and patterns without loosing any of the softness associated with 'standard' sheepskin rugs. We hope you enjoy browsing through them and please feel free to contact us with any questions - they are fully machine washable and can be sent anywhere in the world! With Autumn in full swing and the prospect of Winter approaching, the season of hearty stews and long Sunday roasts is upon us. To celebrate this we are offering our delicious North Ronaldsay mixed bags of lamb at a special price of only £8 per kilogram! For new customers, this is a wonderful opportunity to have a try of this special meat and for existing customers it offers the chance to top up your freezer. We offer free delivery up to twenty miles from the farm for an order value equivalent to a whole lamb and often we do a run to a number of people in one area so tell your friends. Alternatively you can collect from the farm and see the animals as well. Lauriston Farm now offers its organic North Ronaldsay yarn and throws for purchase online via the Etsy web site. Etsy is an e-commerce web site focused on the buying and selling of handmade items. right on the Blackwater Estuary, just outside Goldhanger in Essex. Along with the usual AGM business meeting there will be a presentation and update on the Biodynamic Seed Project followed by lunch (for a small charge) which will be produced from as much of the farm’s produce as possible! After lunch, a farm walk will allow you to explore the farm and it will take us to the Blackwater Estuary sea wall. Finally, we will be making the horn manure that the farm will need for the coming year - a great opportunity to learn or hone your cow horn filling skills. Appropriate clothing and footwear will be needed for the farm walk as it can be very windy, also for the business meeting and talks which will be held in our cattle shed. There is ample parking, local overnight accommodation, including on farm camping. Members, friends and anyone interested in attending are all welcome to all or part of the day.